It started as just an idea in January of 2003. That idea grew rapidly from the initial notion of having a stage upon a hay wagon and a bunch of speakers covered by blue tarps. 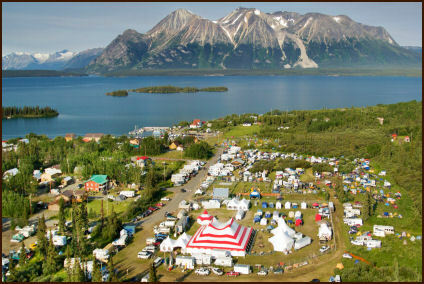 By July, there was a big-top tent, 800 people, 70 performers, 30 artisians, 20 Atlin Artists, 12 music and art workshops, 3 stages, 2 art exhibitions and 1 real good time! 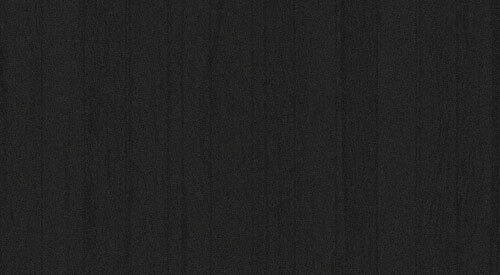 The Atlin Arts & Music Festival proved that a small town, despite its dwindling population, could organize an outstanding event and attract people in great numbers from across the north. The festival was about music and art but became very much about community. Its success was due in great part to how well the town opened its doors and its arms to the massive influx of people-quite possibly the largest group for an event in Atlin since the Goldrush. 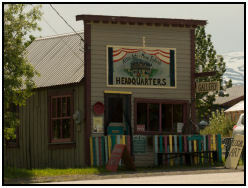 The town acted as more than just the location for the festival; the town was the festival. There was music and art happening everywhere; the Globe Theatre, the Courthouse, Kershaw’s Cafe, St. Martin’s Church, The Garrett Store, the Studio, the Teen Centre, the Recreation Centre, the Mainstage at Tarahne Park, the campgrounds, and in the streets. One musical jam session, that spontaneously occurred on the front patio of Kershaw’s, drew a crowd so large it basically stopped traffic. There were jam sessions on cabin porches and all over the park that were still going on when the sun came up the next day. Performers came principally from the Yukon, Alaska and northern British Columbia. Most were professional artists, but a few were emerging artists. Since the festival was pulled together on a shoestring budget, all performers offered their services at no cost- receiving only food, lodging, and gas money in return. These performers made the festival happen. What Atlin offered its visitors was a relaxed, grassroots family festival. It was about enjoying good music and good art in good company. One musician said it was like a musician’s festival where the music, and the enjoyment of it, was given top priority. The other distinctive aspect of the Atlin Festival was the diversity of art forms represented. In addition to the many styles of music, there were storytellers, children’s performers, clowns, film, and many music and art workshops. 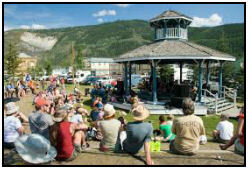 Above content derived from Atlin Festival website.